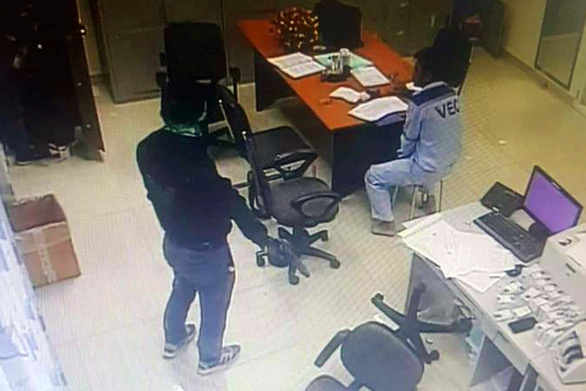 Police said on Friday they captured the two armed suspects who stormed into the toll booth of an expressway connecting Ho Chi Minh City with the neighboring province of Dong Nai and fled with about VND2 billion (US$86,300) in cash one day earlier. The two were arrested when they were hiding in Ho Chi Minh City, according to officers. The robbery at the toll gate of the Ho Chi Minh City - Long Thanh - Dau Giay Expressway grabbed local headlines as it took place on the third day of the new lunar year, the last out of the three main days of celebrations of Tet, or the Lunar New Year, in Vietnam. CCTV footage shows two men wearing sports shoes, wool hats and black jackets outside white T-shirts threatening a toll booth attendant with their weapons, one of which appears to be a gun, to get the money. Dong Nai police immediately examined the scene of incident and announced the preliminary results of the investigation later the same day. The suspects must have climbed over the back wall to break into the accountant office of the toll station, according to police. It was around 7:00 am at that time, when attendants at the office were changing shifts and the safe containing the toll money collected during the last shift of Wednesday was left open. Upon entering the room, one of the suspects opened fire, shooting at a computer, while the other hit an attendant with the handle of his knife. The suspects then took all the money in the safe, put it into a backpack and fled the scene. Some VND2 billion was stolen in the robbery, according to officers. This still image from CCTV footage shows a suspect threatens a toll station attendant at gunpoint. Police said the robbers were armed with a gun, one knife and a tear-gas canister. During their escape, the suspects dropped a backpack containing some VND80 million ($3,456).